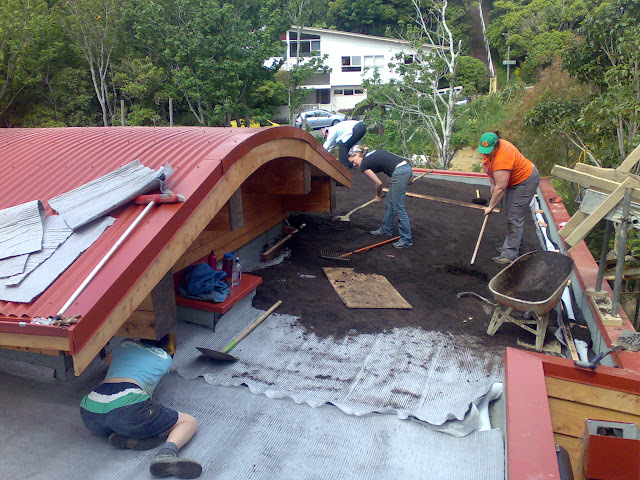 In 2010/11, we planted out the first living roof on a home in Wellington. It’s been just fine. The initial plants were a mix of succulents, seddums, and native ground cover. The roof has enough variation of sun, wind, and shade that some did well in areas, some in others, and nothing died out. Since then, koromiko has self-seeded and grown up, just as it does all over Wellington. It’s growing so well that we’re trying some other, lower-growing hebes. A few other native trees have found their way up there on their own, like taupata . We were originally told that the soil depth of only 100 mm was too shallow for tussock, but last winter we planted carex secta, flagellifera, and comans green and that’s doing just fine. There’ll be more this winter, though not the secta as that’s too sharp to weed around. Maintenance has been weeding and the only real problem plant has been oxalis. The birds ignored the roof for a few years, but have started to tear the soil up to get at ants. We’re just planting hebe and tussock as that’s too large for the birds to damage and they give more variety to the height of the planting. The koromiko needs pruning at knee height – the thin soil means if they get too big they will fall over. And the random lancewood will need to be transplanted off the roof, coz that can grow to fifteen metres tall. 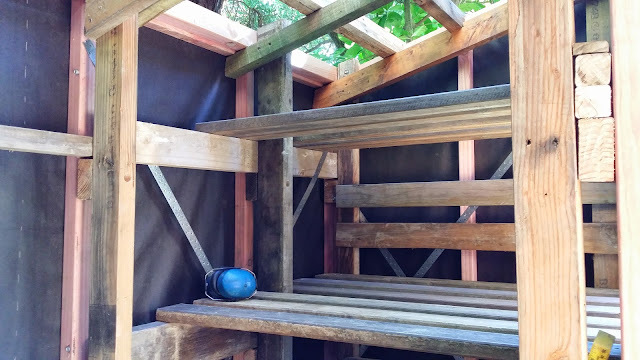 And the firewood shed roof is going great, with the panekenake trying to take over, more carex, and the hen & chicken fern hanging on in the most shaded corner. 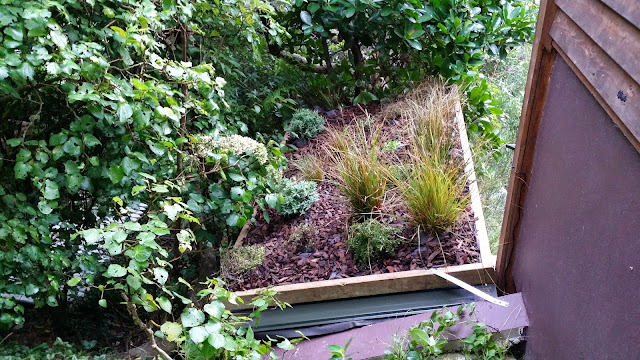 Living roof for the shed: Which plants are still alive? Most of them, it seems. Currently, nineteen out of twenty-one haven’t kicked the bucket. Here’s what the roof looked like as planted, back in May. Currently exploding are the carex secta, virgata, and fagillifera, at the top of the roof in the driest and windiest part. Down at the bottom of the slope, the pratia angulata/panekenake seems very happy. Somewhere in the middle is the leptinella, coprosma prostrata and acerosa, doing quite nicely, although the acerosa is pretty shaded by the trees to the north. The ferns in the darkest and wettest far corner are not dead yet. One of the muehlenbeckia complexa/puhuehue died straight away, the other is hanging in there, despite being in similar conditions. One of the hebe albicans got heavily shaded by a branch before I cut that back and looks like toast, the other is fine. This suggests to me that the tussock will survive on the house roof, so I think we’ll plant some next winter. It’ll be good to see it standing proud over the low succulents and seddums. The only other tall stuff we have up there is hebe stricta, which I like, but grows everywhere and gets so big (above head height) that it’ll fall over in the thin soil on the house roof. 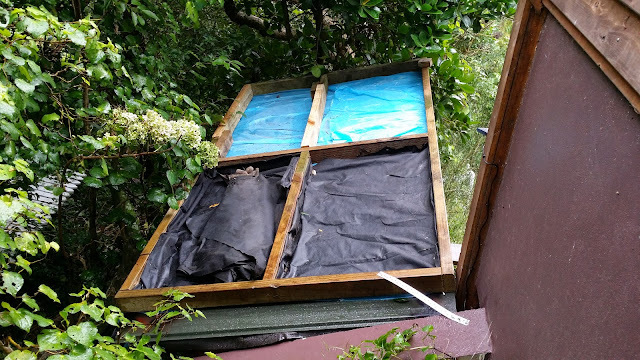 I wanted to put a living roof on the shed, to match the house, to reduce the visual impact of the shed upon the neighbours, but mostly replace the natural habitat taken away by the shed. The roof on the house has been just fine, although we have some weeding to do. For a shed, rather than a house, we could do something simpler, while using up left over wood and soil. 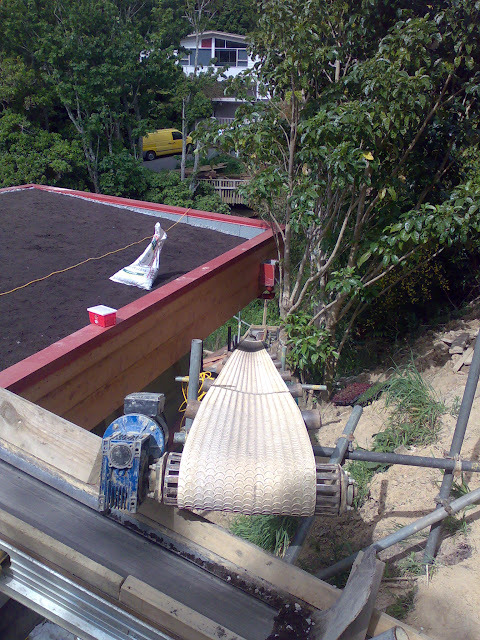 To hold the soil against the slope of the roof, there is a wooden grid. To stop the soil washing away while still letting water drain, there is weed mat and holes bored in the horizontal grid members. I might have got carried away making the grid up, it really didn’t need angled pocket screws, but WTH. The grid is held in place by some stainless strapping over the roof edge and the handy nearby concrete wall. I only want to build this once, so I want to do it right. That means making it strong enough and preventing corrosion… and the shed has a very flexible steel roof. Whoops. 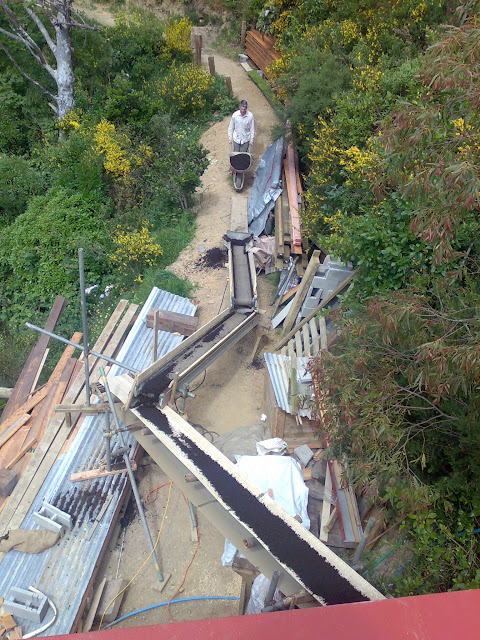 The roof is going to be carrying about a quarter of a tonne of wet soil. On top of a wooden shed. In an earthquake zone. That’s not good and I don’t want all that coming down on someone’s head. 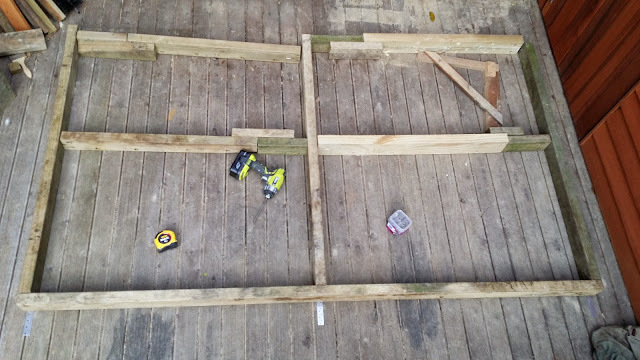 Hence all the uprights in the shed have been at least doubled, there’s three more purlins, and rafters fitted every 400 mm. I used a deflection-limited approach to the structural design, which is a technical term meaning that I jumped up and down on top of it to see how much it flexed under 80 kg. It didn’t. And then after loading it up, I put a straight edge against to rafters to see how much they had bent. I couldn’t detect any bending, so I think it’s good. As for corrosion, the shed roof is coloursteel, so half a mil steel, galvanised with lots of zincalume, and baked on paint. It’s warranted for fifteen years, even in salt spray zones. (Yes, we’re in a salt spray zone, despite being 150 metres up and three kilometres inland. We’re inland from Cook Strait, which is one of the roughest and windiest pieces of water in the world.) So it should be good, right? I mean, that’s what nearly every house in NZ uses… although it keeps plenty of people employed replacing roofs every few decades. Coloursteel is great if it gets to dry out every so often and the rain washes the crap off it on a regular basis. Sadly, it shouldn’t be used in contact with permanently wet materials or soil, which is a bit arse for a roof that’s going to be covered in soil. 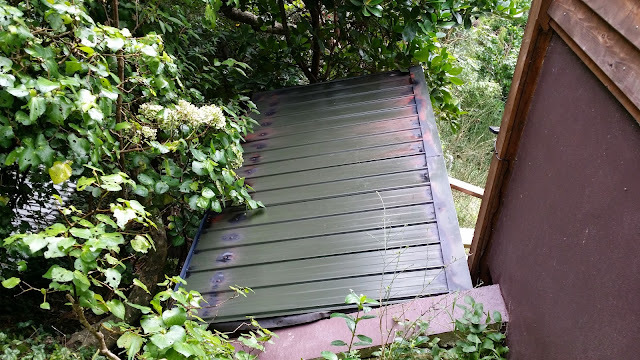 The steel roof is also going to be impossible to inspect for rust without digging up the plants, leading to a possibility of the whole thing collapsing on someone. So to keep it from rusting, there’s a layer of polythene directly on the steel, doubled over so that staples holding the top layer to the wood are separated from the steel by the bottom layer of the film. For good measure, the top edge of the poly is also siliconed against the steel, to stop water running down between them. I probably should have put a flashing over that edge, but we’ll see how it goes. The poly is protected by weed-mat, which also covers the drain holes in the horizontal parts of the grid. For the plants, I ended up scratching my head somewhat. The micro-climate on the roof varies from sunny to shaded. It’s in a damp spot that gets plenty of rain, but with the thin (100 mm) soil it’ll vary from moist to very dry. And then there’s huge amounts of wind, coz this is Wellington. In the end, I just used Greater Wellington’s regional plants guide and chose the toughest natives from a bunch of ferns, low cover, and sedges. 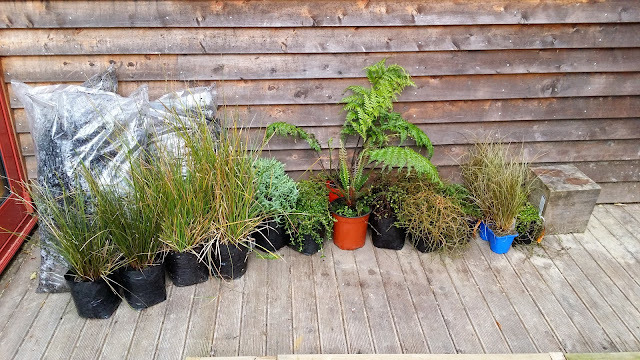 From left to right: carex secta, carex virgata, hebe albicans, coprosma prostrata, asplenium gracillimum/hen & chicken fern, blechnum discolour/piupiu, muehlenbeckia complexa/puhuehue, coprosma acerosa, leptinella diocia, carex fagillifera, pratia angulata/panekenake. And then there were some extra leptinella from the house roof of a different kind, which seems to do very well in shady spots. These ended up spread across the roof, with the ferns to the north in the shade of the tree and the sedges to the south where it’s more exposed. I’ve no idea what will survive, but plenty of weed mat and bark mulch should help. Mostly, I like that from above you can barely see the shed at all. 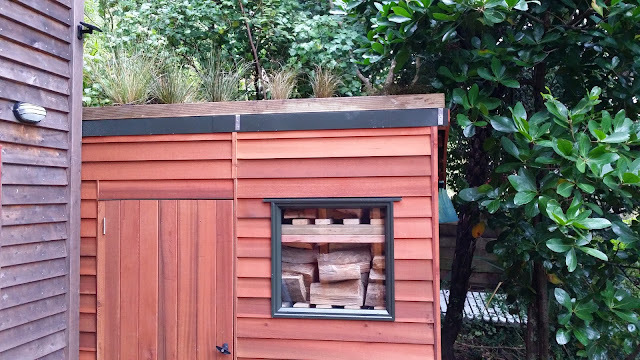 From the front, the sedges stick up over the roof and the coprosma should creep over the edge of the roof-line, helping the shed to blend in. And hopefully, it’ll last a good long time. Ask me in a decade or two how it’s going. If you don’t want anything to rust, use stainless fasteners, right? Nope. Stainless is good on its own, galvanised is good on its own, put the two together and you’ve made a battery. The zinc gets eaten by the stainless. The straps that stop the whole thing sliding down the roof are stainless and they’re screwed directly to the galv. Bother. I’m going to have to put some non-conductive plastic between them and replace the screws with plastic rivets. I don’t think the weed mat will blow away, but we’ve a 120 k storm developing today, so I guess I’ll find out. I should have put some rocks around the edge. I planted the tall sedges right next to the solar panel for the shed internal light. I’ve enough cable to raise the panel up by a metre or two, but that was dumb. We’ll be up there tomorrow, for more. 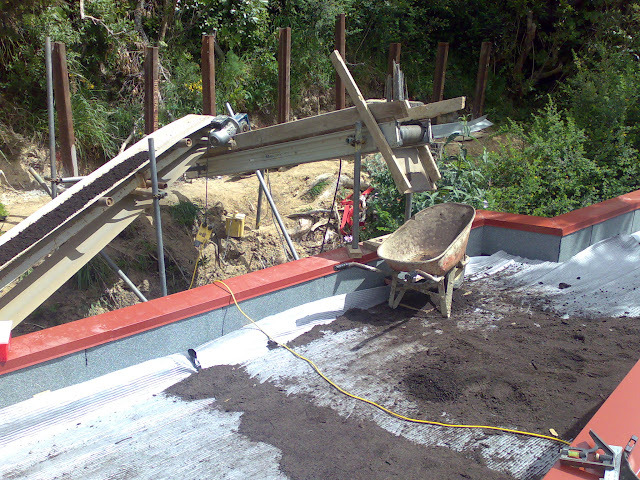 So this weekend, we (meaning tieke, myself, and a veritable horde of helpers) moved nine cubic metres of soil up two storeys onto the roof, spread it, leveled it, and made a good start on the planting. And then you spread the earth across the drainage mat on the roof. 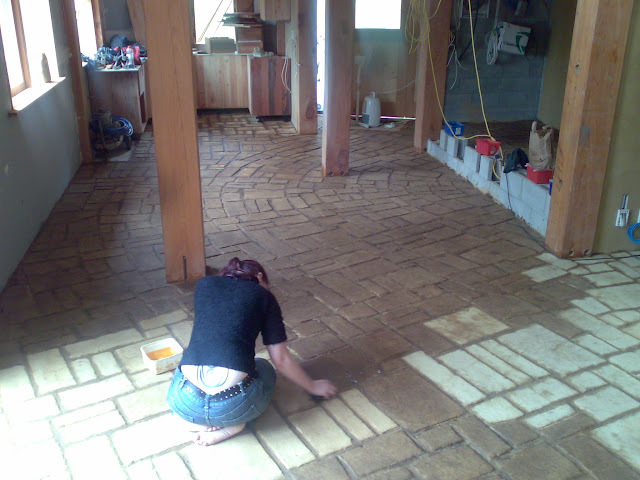 With minor complications of putting round pebbles around the edges and drains. And that’s as far as I got with photos from the process, coz mostly we were running about, trying to keep the everything going, removing bottle-necks in the process, finding jobs for everybody, failing to provide refreshments, and trying to get some shoveling in myself. tieke has more pics from Sunday, I think. We got all the soil done by 4 pm on Sunday, and then started on the planting. That goes much faster, I think we managed about a quarter of the two thousand plants before it got too dark to see. Yeah, we’re pretty knackered now. The rest of the plants will be planted over the next three evenings and then I might have to take Thursday off to get this finished. Hell, I’d like to take today off but I’m buggered I’ve got important work to do, honest. And then after that, there’s copious watering to do. 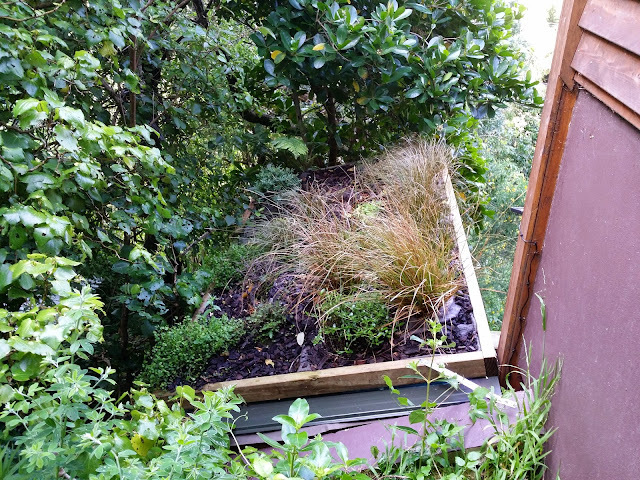 And if you want to help with Wellington’s first green roof on a house, let us know. Tired now, going to fall over. 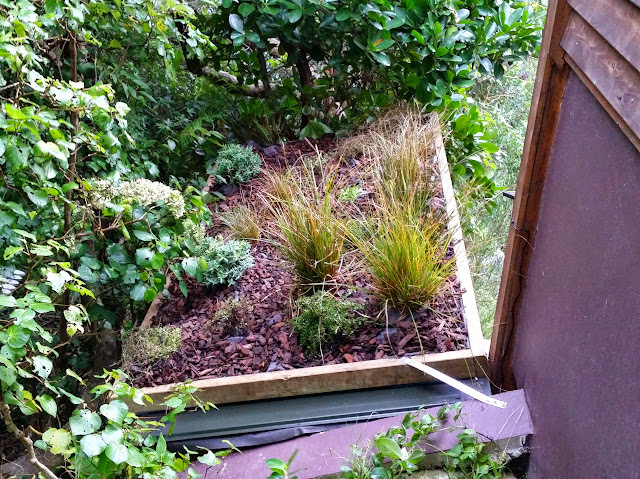 This weekend we’ll be planting our green roof, the first residential green roof in Wellington. We fought the Council for a year to get this through and part of our motivation is to make this easier for the next people who want a green roof. We could definitely do with a hand. We’ve already got the waterproof membrane laid, and the insulation, and the other waterproof membrane. 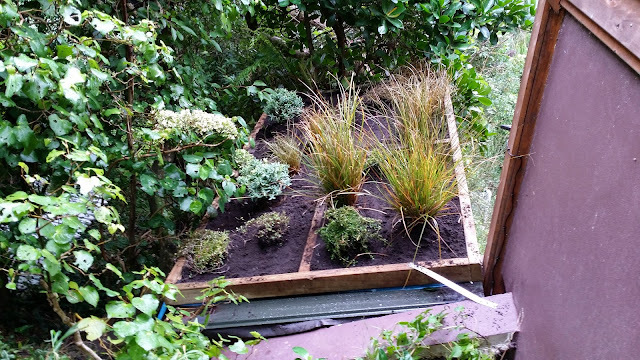 Next comes the drainage mat then ten cubic metres of soil and lots of plants, a mix of sedums and succulents, with some tussock to come later. Two and a half thousand plants arrived yesterday, the soil/pumice mix arrives later this week, the conveyor belts get put in place friday, then we’ll be shoveling soil onto conveyor belts, spreading it across the roofs, and planting little baby plants until we’re done. So, if you’re keen to help, we’d be very grateful. We’ll be up there from 10 am Saturday and Sunday. Weather looks variable to nice and we’re sheltered from the southerlies. If you want a lift up there, let us know otherwise there’s easy buses and/or parking. 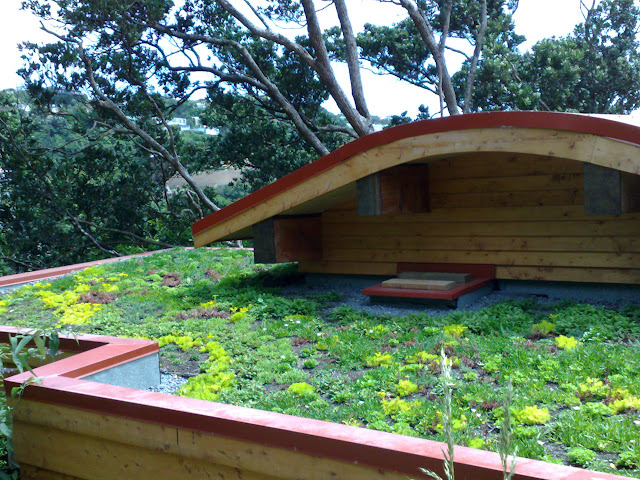 We’ve been working with Greenroofs Ltd, who did the Waitakere Civic Centre and a big Uni of Auckland building. This might be their smallest job ever, so far.